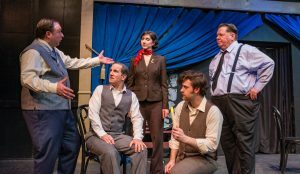 Playwright, actor and director Austin Pendelton’s play Orson’s Shadow, a fictional exploration of a 1960 rehearsal with some of the most famous theatre luminaries of the time is the latest offering by Cyrano’s Theatre Company. The “Orson” of the title refers to “Orson Wells”, director and actor of such works as Citizen Kane and War of the Worlds. Other famous characters include Laurence Olivier, Vivien Leigh, Joan Plowright and Kenneth Tynan. David Haynes, who plays the title character along with Stefani Suydam (Vivien Leigh) and director Dave Dahl drop by Stage Talk this week to chat about how the play has been going. Orson’s Shadow is currently performing at Cyrano’s and continues its run until April 1st. ORIGINAL BROADCAST: Friday, March 23 at 2:45 p.m.